There are brain regions (X) that show stronger activation for joyful music, regions (Y) that show stronger activation for sad music, and regions (Z) that show similar activation for both. Both joyful and sad music produce similar activation of the amygdala-hippocampal area, with activation extending into the parahippocampal gyrus, as well as activation of the prefrontal, temporal, and anterior cingulate cortices and the precuneus (regions Z). Joyful music produces stronger activation in the dorsolateral prefrontal cortex, the cingulate gyrus, the inferior temporal gyrus, the cerebellum, and in the vicinity of the ventral medial frontal cortex (regions X). On the other side, it has repeatedly been found that happy music is characterized by fast tempo and major mode, whereas sad music is typically played in slow tempo and minor mode. By which specific neuronal mechanisms does fast tempo and major mode music activate more strongly brain regions X than regions Y? And vice versa. Is it by some kind of fine-tuned resonance (involving feedback) between the sensory input from the ears and the brain regions involved? Are there specific theoretical (computational) models, and have they been tested? How can - by these mechanisms - the subtle difference between a major and a minor third become so significant, both neuronally and emotionally? 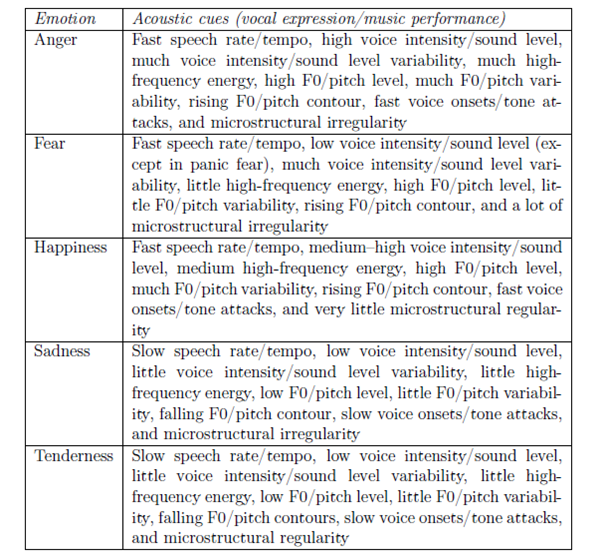 In a comprehensive review that included 140+ primary research papers, Juslin & Laukka (2003) explain that there is a close relationship between vocal expression of emotions and the musical expression of emotions. Indeed, music and speech have similar characteristics and therefore can illicit similar emotions (table 1). The tones in music seem like a characterization of the tones in human speech, which indicate emotional content. The vowels in the phonemes of a song are elongated for a dramatic effect, and it seems as though musical tones are simply exaggerations of the normal verbal tonality. Not the answer you're looking for? Browse other questions tagged cognitive-neuroscience emotion theoretical-neuroscience cognitive-modeling music or ask your own question. Do the brains of non-altruistic persons mirror the observed experience of suffering? What are “linear spatial weightings” and “specific temporal windows” in Philiastides & Sajda (2006)?